Choose a banana that are not 100% ripe. It means that the banana should have some green highlights on the yellow skin. Peel and cut the banana in diagonal direction about 1 inch thick making an oval shape. Add banana pieces to the hot coconut milk and fold in. 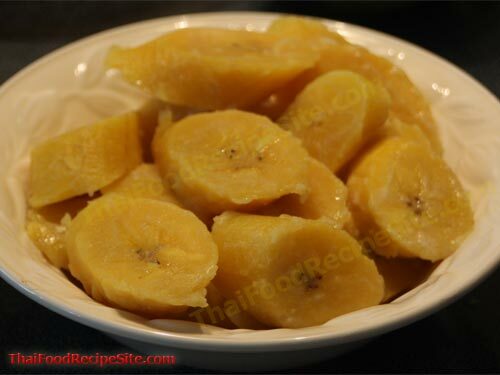 Lower heat to medium and let it cook for 5 to 10 minutes or banana is softened considerably. When its done, the dessert is ready to serve. It can be served immediately or after it is cooled down. You can refrigerate the leftover and rewarmed it the next day in a microwave.